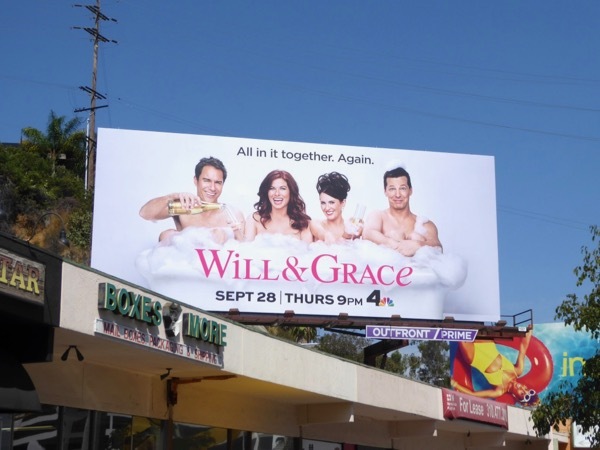 This TV season it isn't "Just Jack" that is returning to NBC, all the gang's back and they're soaped up and ready to tickle your funny bone with the return of Will & Grace (and Karen & Jack). 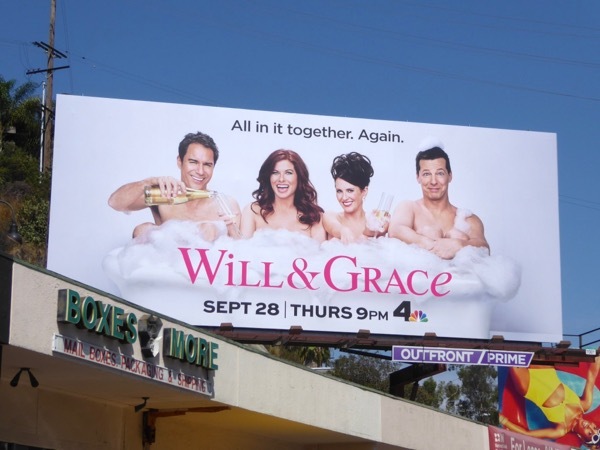 If there's ever a time we need a good laugh it's now post hurricane and election season, so crack open a bottle and celebrate the revival of Will & Grace for a ninth season, eleven years after the show went off the air with a 'series finale' on May 18, 2006. A lot has happened in the world and America in the intervening years, The Obama Years, the repeal of the military's Don't Ask, Don't Tell policy, Cher said farewell to touring then returned to touring, hookup apps like Grindr and Tinder launched, RuPaul's Drag Race became a cultural phenomenon, the increase in transgender awareness, the success of marriage equality, and of course the big orange cloud hanging over everyone's head. 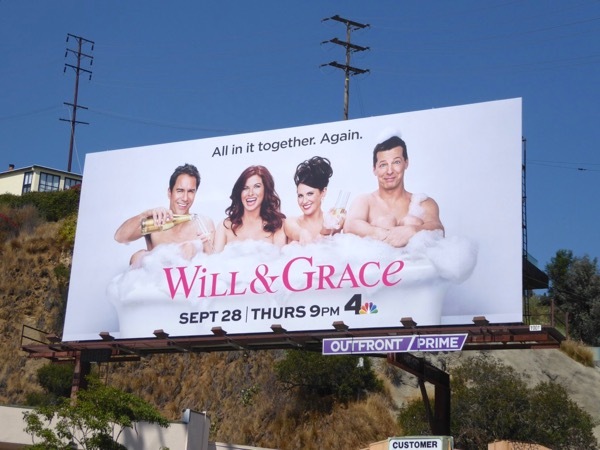 That's a lot of history to cover and comedy gold to be mined by Eric McCormack and Debra Messing's gay lawyer and straight, Jewish interior designer best friends, 'Will Truman and 'Grace Adler', living in their New York City apartment. 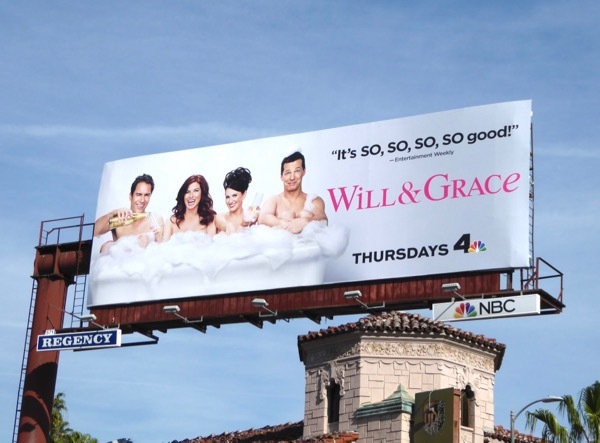 Fortunately the comedy can be spread out with the help of Sean Hayes hilarious actor-singer-dancer wannabe 'Jack McFarland' and Megan Mullally's wealthy pill-popping, booze-swilling, maid-abusing socialite, 'Karen Walker'. 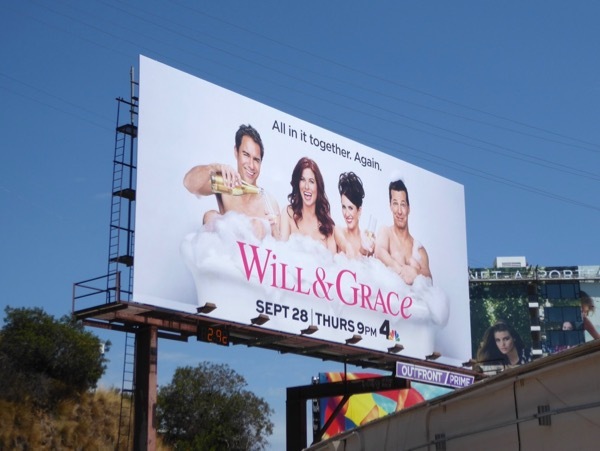 Apparently new episodes will return to the status quo of the two roommates trying to find love and happiness in NYC as if the series finale and married life with kids never happened, meaning there's plenty of room for new loves, new rivals and new laughs. Daily Billboard is sure we can expect a whole bevy of returning cameos and guest stars, although Shelley Morrison's retirement means that Karen's maid 'Rosario' won't be around to bicker with and clean up after her employer. 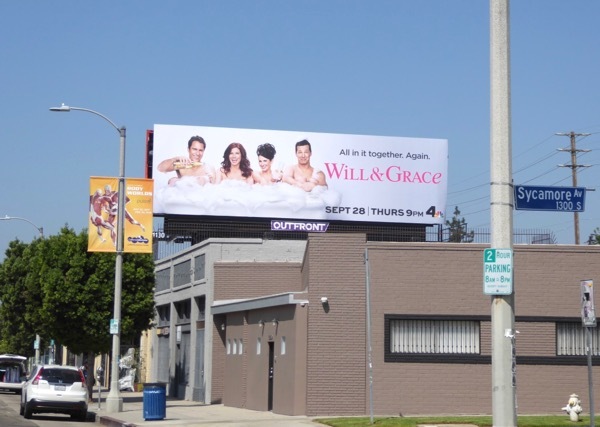 These bubbly Will & Grace series revival billboards were snapped along the Sunset Strip on September 5, then later along Pico Boulevard and Melrose Avenue through September 13, 2017. 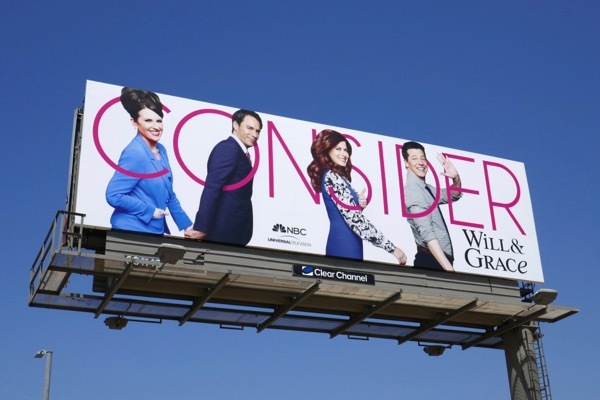 Fans of Eric McCormack can also enjoy these Perception TV series billboards, admirers of Debra Messing can check out these Smash billboards and these billboards for The Mysteries of Laura and you can see more of Sean Hayes in this NBC billboard for his solo sitcom, Sean Saves the World. Raise a glass and toast to the return of a fabulously funny sitcom (and keep everything crossed that it's still fresh, funny and relevant after all these years). 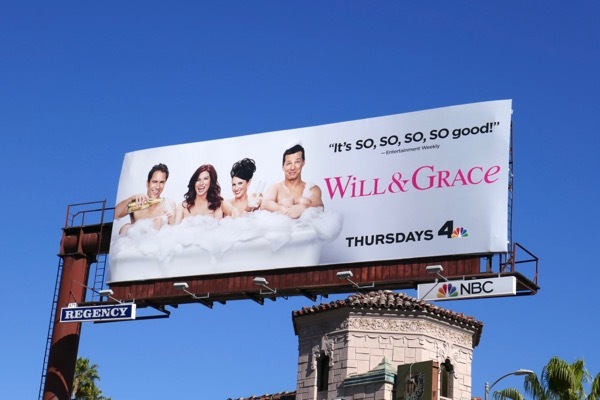 UPDATED: It turns out it is sometimes worth resurrecting an old sitcoms, as Will & Grace seems to be getting even better with age. 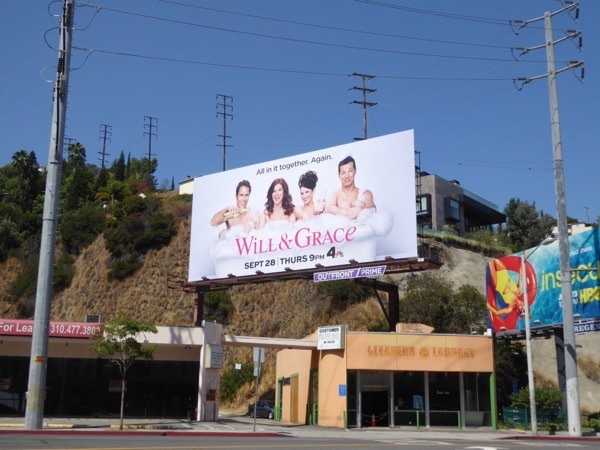 Here's a billboard for the return of all-new episodes for the show's ninth season spotted above Sunset Boulevard on January 10, 2018. 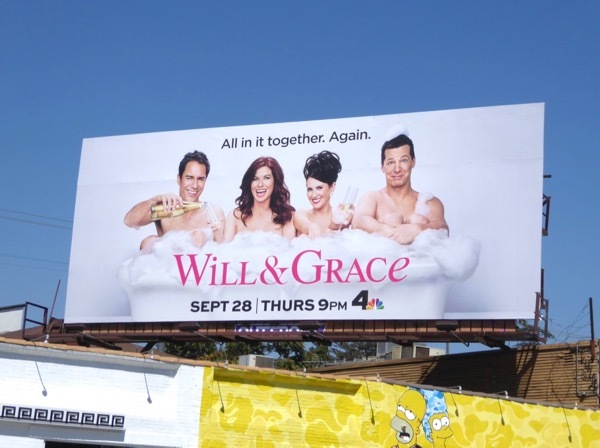 And here's the bubbly billboard on a less cloudy day too. 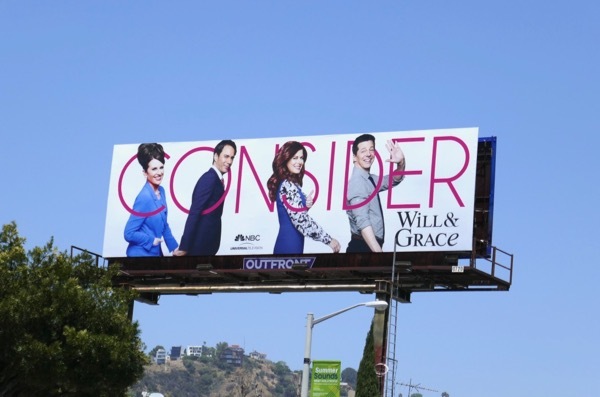 UPDATED: Here's also some Emmy consideration support for the revived sitcom spotted along Olympic Boulevard and Fairfax Avenue on June 1, 2018. 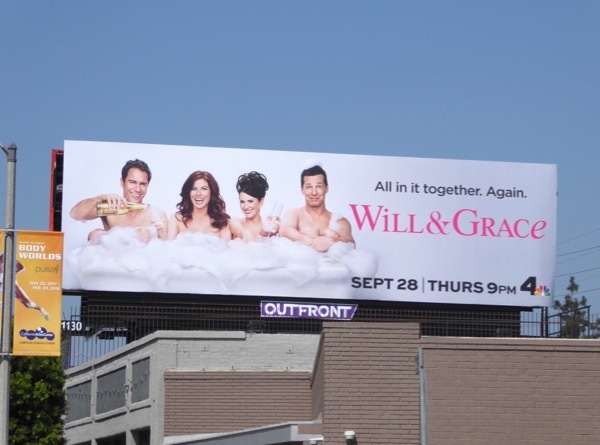 Can Will & Grace add to its record 83 nominations and 16 Emmy wins this season?